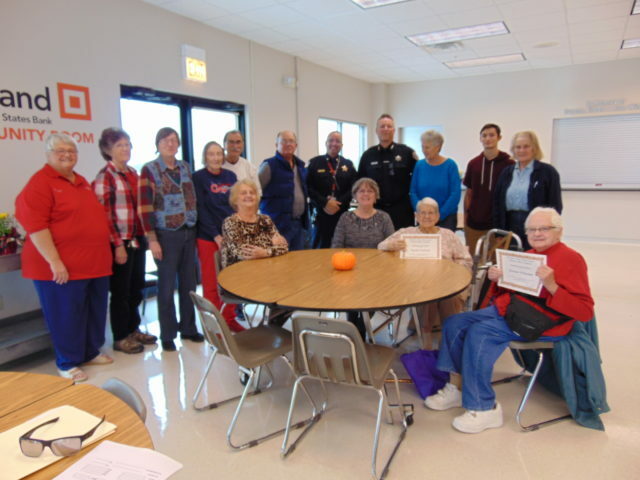 Deputy Chief Matt Wallace, Officer Tim Blankenship, and three Volunteers in Police Service (VIPS) join the first Fall Citizens Police Academy graduating class at the Keen Age Center. Session 10 of the Citizens Police Academy was a time of celebration. Police Chief Woody came to the Keen Age Center to do the keynote address for the graduation. “It is important that the community understands who we are, what we do, and why we do it,” he said. “We are fantastic at working with the community when crime is involved. Most of the time members of the community report the crime because of the trust we have built with them. “Classes like this are not something that everyone has the opportunity to do. You are part of a select few to learn more about the inner workings of the Belvidere Police Department. We are very proud of our interagency cooperation. “It is a common misconception that law enforcement is only around to neutralize threats with extreme force. Killing is a worst-case scenario, not something we want to do. Sometimes we don’t have a choice. We try to do the best we can to handle situations without the use of force. The BPD is relatively small for the size of this community and officers cannot be everywhere. When members of the community trust the police, pay attention to odd sounds and strange things going in around them, and are not afraid to let the police know – good things happen.